Holiday Home for Sale – Corner Lot, Fenced Yard! Whether you’re starting your life together or looking to downsize to a cozy 2 bedroom/2 full bath/1 car garage home, there’s this charming one in Holiday. 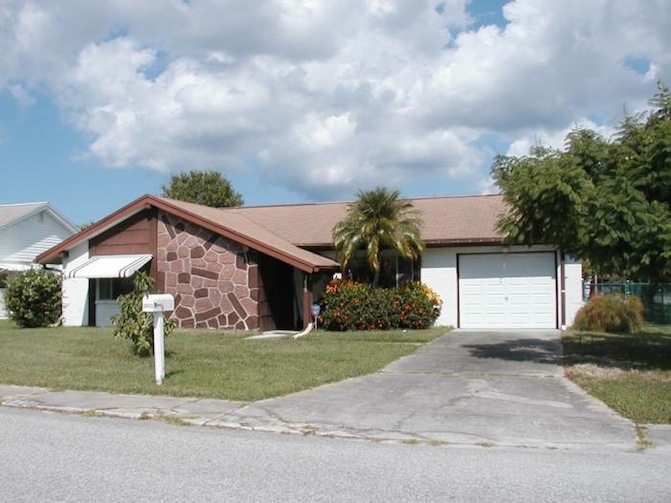 Situated on a spacious corner lot with a fenced backyard, you’ll enjoy plenty of privacy to relish the Florida weather and the ease of outdoor entertaining from your Florida Room or outdoor patio. You’ll love the easy care 18″ tile flooring throughout! The kitchen boasts an over-sized serving port to the family room and opens right into the adjacent dining area. You’ll find lots of cabinets, pantry and updated appliances. The floor plan overall is ideally designed as the rooms effortlessly transition into one another making the home feel very warm and welcoming. With a separate formal living room plus family room, there’s room for all those special gatherings and holidays! The master bedroom has a walk-in closet and private bath. Updated hall bath, newer central heat and air and newer hot water heater finish out this picture perfect home! Moments away from US 19 with all its shopping and dining plus Sand Bay and Anclote Parks. What more could you ask for? https://trinityeastlakerealestate.com/wp-content/uploads/2018/03/LC-WebLogo-340x156-300x138.png 0 0 loricrawford https://trinityeastlakerealestate.com/wp-content/uploads/2018/03/LC-WebLogo-340x156-300x138.png loricrawford2013-10-19 08:58:182013-12-02 11:31:22Holiday Home for Sale - Corner Lot, Fenced Yard!